To Cite: Haghighat M, Mirghafourvand M, Mohammad-Alizadeh-Charandabi S, Malakouti J, Erfani M. The Effect of Spiritual Counseling on Stress and Anxiety in Pregnancy: A Randomized Controlled Clinical Trial, Iran Red Crescent Med J. 2018 ; 20(4):e64094. doi: 10.5812/ircmj.64094. Background: Considering the undesirable consequences of stress and anxiety in pregnancy and the role of midwives in providing emotional support for pregnant women, it is essential to utilize non-medical therapies, such as spiritual counseling. Objectives: The present study aimed to determine the effect of spiritual counseling on stress and anxiety in pregnant women. Methods: This randomized controlled clinical trial recruited 112 pregnant women presenting to the health centers in Maragheh, Iran, in 2016 - 17. The participants were assigned to two 56-member groups of control and intervention with a randomized block design. A socio-demographic questionnaire, the perceived stress scale, and the Spielberger state-trait anxiety inventory (STAI) were completed before and four weeks after the intervention through interviews with participants. Results: 55 participants in the counseling group and 56 in the control group were followed up and analyzed until the end of the study. The mean (± SD) scores of stress, state anxiety, and trait anxiety were 35.4 (± 4.5), 48.5 (± 4.8), and 47.4 (± 4.6) in the counseling group and 34.8 (± 3.6), 47.8 (± 4.1), and 49.0 (± 4.1) in the control group before the intervention, respectively. The mean (± SD) scores of stress, state anxiety, and trait anxiety were 34.8 (± 3.5), 48.0 (± 4.5), and 44.7 (± 4.0) in the counseling group and 37.8 (± 3.7), 49.7 (± 4.2), and 46.0 (± 3.8) in the control group four weeks after the intervention, respectively. According to ANCOVA for controlling the baseline scores after the intervention, the mean scores of perceived stress (adjusted mean difference = -3.4; 95% confidence interval = -2.3 to -4.4; P < 0.001) and state anxiety (-2.1; -3.6 to -5.5; P < 0.001) were significantly lower in the counseling group, while the two groups had no significant difference in terms of the mean scores of trait anxiety after the intervention. Conclusions: Spiritual counseling can control perceived stress and state anxiety of pregnant women. Therefore, spiritual counseling is recommended as a complementary and effective intervention in managing the psychological problems of pregnant mothers. Pregnancy, as a natural event in the life cycle of women (1), is associated with profound changes and challenges and it affects the physical and mental health of women (2). In addition to having hormonal changes at the beginning of pregnancy, women change their attitudes toward life and start to assess their skills and lifestyle (3). If they do not have the proper support, they will suffer from reduced self-esteem and worry about the health of the baby and the process of delivery and may experience abortion (4). Stress during pregnancy can be associated with adverse pregnancy outcomes (5). It takes all the energy of woman’s body and disturbs her function (6). Stress stimulates the adrenal gland and the sympathetic system, which increases respiration, heart rate, pulse and blood pressure through a complex process (7) and causes complications such as preeclampsia (8) and spontaneous abortion (9). Anxiety is sometimes a natural mechanism for coping with mother’s mental concerns and accompanying changes, but sometimes anxiety can take the form of a disease and become so severe that affects the mental health of the pregnant mother (10). Based on another study in Bandar Abbas, Iran, 45.6% of pregnant mothers had state anxiety and 45.3% had moderate to high trait anxiety (1). By stimulating the autonomic nervous system, chronic anxiety contracts the arterial muscles, reduces uterine-placental blood flow and oxygen supply makes the fetal heart rate pattern abnormal, and increases the probability of preterm labor (11). Anxious pregnant women give birth to children with lower psychomotor scores and more behavioral problems (12). One of the mechanisms of coping with depression, anxiety, and stress during pregnancy is paying attention to the women’s beliefs and values, including spirituality, ideology, ethics, and cultural values (13). The world health organization recommends a comprehensive care approach addressing the four dimensions of physical, mental, social, and spiritual needs of patients (14, 15). Spiritual and religious counseling examines the cognitive, behavioral, and emotional dimensions of the individual. The cognitive dimension seeks meaning, concept, and purpose of life and the values that matter to the patients. The emotional dimension addresses the variables of hope, interest, and support in the recovery process and the behavioral dimension addresses spiritual and religious beliefs (14). Spirituality is a natural desire in a person that gives meaning to life and creates power within the individual and is, in fact, an empirical indicator of human superiority in life (15). Engagement with religion protects people mentally and physically (16). Group counseling, as a bilateral process in which the counselor and the peer group examine the problems, feelings, attitudes, and values to modify the attitudes and perception of people, is considered as a strategy for preventing mental disorders during pregnancy (17). In spiritual counseling, the counselor spiritually supports the mother based on her religious beliefs, gives her hope to assess her pregnancy-related concerns from her spiritual and religious point of view identifies her spiritual concerns and doubts, and corrects her misconceptions (18). The spiritual dimension needs special attention during pregnancy and midwives play an essential role in providing counseling and psychological support to pregnant mothers. Furthermore, anxiety and stress should be controlled during pregnancy. Therefore, due to the lack of a study in this regard and considering the role of spirituality in life satisfaction (19) and quality of life (20), this study aimed to assess the effect of spiritual consultation as a complementary and non-invasive intervention on stress and anxiety during pregnancy through a customized approach tailored to the culture and religion of Iranian people with regard to the importance of religious beliefs in their lives in critical situations. This randomized controlled clinical trial recruited 112 pregnant women presenting to the health centers in Maragheh, Iran, from February 2016 to June 2017. The participants were experiencing their first, second, or third pregnancies with a gestational age of 20 to 24 weeks, with a contact number for follow-ups, with an Edinburgh depression score of less than 12 before the intervention, with no underlying diseases (cardiovascular disease, hypertension, diabetes, mental illness, and so on. ), and willing to participate in the study. The exclusion criteria were any underlying diseases (cardiovascular disease, hypertension, diabetes, mental illness, and so on. ), a history of physical and mental illness according to the patient, recent stressful life events, smoking, alcohol and drug use, taking medications that affect an individual’s body or mind, and a previous attendance in the spiritual counseling classes. The sample size was determined using G-Power software, assuming a 15% reduction in perceived stress, anxiety, and depression with a test power of 90% and a sample loss of 10%, based on perceived stress data of a study by Bastani et al. (21) (m1 = 30.98; m2 = 26.33; sd1= sd2 =5.94; n = 16) and state anxiety (m1 = 38.5; m2 = 32.7; sd1 = sd2 = 9.9; n = 51) and trait anxiety (m1 = 41.2; m2 = 35.0; sd1 = sd2 = 9.2; n = 39) as follows. Considering the fact that the determined sample size based on state anxiety was more than that of other variables, the sample size was determined 56 people in each group with a 10% probability of sample loss. Sampling was performed after obtaining approval from the ethics committee of Tabriz University of Medical Sciences (code: TBZMED.REC.57401) and the registration of the study in the Iranian registry of clinical trials (IRCT2016122710324N37). Sampling was carried out in 15 health centers in Maragheh, Iran. The health centers are public, governmental, or private first-level referral centers. The researcher attended the centers, extracted a list of pregnant women with gestational age of 20 - 24 weeks, and recorded their names and telephone numbers. Then, they were contacted by phone to explain the purpose and method of the study. If they were willing to participate in the study cases that fulfilled the inclusion and exclusion criteria, and if they were eligible, they were invited to attend a health center. During the personal visits, if the pregnant woman was willing to cooperate with the study, an informed consent was obtained and then the Edinburgh depression scale was completed through an interview with the participants. If the depression score was more than 12, the person would not enter the study and she would refer to a psychiatrist. Then, a socio-demographic questionnaire, the perceived stress scale (PSS), and the Spielberger state-trait anxiety inventory (STAI) were completed by the researcher through interviewing the participants. The pregnant women who completed pretest questionnaires were randomly assigned to two 56-member groups of intervention (receiving counseling) and control using a computerized random number table through stratified blocking according to the number of pregnancies (first, second, or third), with four and six block sizes. In order to conceal the assignment, the type of intervention was written on pieces of papers and placed in opaque, numbered envelopes. The envelopes were opened in the order of entry of the individuals to the study and the pregnant women were placed in the intervention or control group. The content of counseling for these women included education, counseling, listening to the Holy Quran, correct breathing, progressive muscle relaxation, massage, group discussion, discussing the role of women and motherhood in Islam, etc. Counseling sessions were six 60-minute sessions, run by the researcher and an assistant (a religious expert) in the relevant health centers and in a room intended for consultation with a relaxed and private atmosphere. The number of participants in each session ranged from 7 to 10 people. The counseling was in the native language of the participants. At the end of the session, individual counseling was provided at the request of each of the participants. Four weeks after completion, PSS and TSAI were completed in the health centers again. The data were collected through a socio-demographic questionnaire, PSS, and STAI. The questionnaires were completed by the researcher through interviews. The socio-demographic questionnaire included questions about participant’s age, age at marriage, weight, and height, participant’s and spouse’s education level, participant’s and spouse’s employment, adequacy of monthly family income for living expenses, and housing status. The validity of this questionnaire was confirmed by content and face validity. PSS consists of 14 items and scores are based on a 5-point Likert scale from never to often. Questions 4, 5, 6, 7, 9, 10, and 13 were scored in reverse such that zero was the lowest score and 56 was the highest. The reliability of the Persian version of PSS was reported by Bastani et al. as 74% (21). STAI consists of 40 items and two parts; the first part pertains to the state anxiety with 20 items scored on a 4-point Likert scale. The second part has 20 items for assessing the trait anxiety. A minimum score of 20 and a maximum score of 80 are obtained for each of the state and trait sections. STAI correlates with Taylor Manifest Anxiety Scale, which indicates the validity of this scale. The correlation coefficients were reported between 75% and 85%. Its validity and reliability have been investigated in several studies, including Gholami’s study in Iran (22). After collection, data were analyzed in SPSS v. 21.0 software (IBM Corp., Armonk, NY, USA). Normality of the quantitative data was approved by the K-S test. All data showed a normal distribution. Descriptive statistics including frequency and percentage, mean, and standard deviation were used to describe the socio-demographic characteristics. Chi-square for trend, Pearson’s chi-square, Fisher’s exact test, and independent samples t-test were used to determine the consistency of the groups regarding sociodemographic characteristics. The independent t-test and ANCOVA with adjusting the baseline values was used to compare the mean of state and trait anxiety and stress among the study groups respectively before and after the intervention. Analyses were done based on intention to treat and P<0.05 was considered significant. There was no significant difference between the groups in terms of socio-demographic characteristics (P > 0.05). The mean (± SD) of the participants’ age in the counseling and control groups were 28.1 (± 5.3) and 28.6 (± 5.1) years, respectively. The mean age at marriage in the counseling and control groups were 22.65 (± 4.7) and 21.6 (± 4.06) years, respectively. The mean BMI in the counseling and control groups was 26.7 (± 3.9) and 27.09 (± 3.1), respectively. The majority of women in the counseling (78.6%) and control (91.1%) groups were housewives. About half of the women in both groups (44.6% in counseling and 46.4% in the control group) had a university degree. In terms of income status, the majority of women in the counseling group (67.9%) and about half of the women in the control group (42.9%) stated that household income was adequate. Half of the women in both groups (50% in the counseling and 46.4% in the control group) were primiparous. The majority (44.6%) of the spouses in the counseling group and 37.5% of them in the control group had a high school diploma or higher education. Only 5.4% of the spouses in the counseling group and 1.8% of them in the control group were unemployed. More than half of the participants (58.9% in both groups) owned a house (Table 1). aValues are expressed as N.(%). bThe numbers indicate mean (±SD). There was no significant difference between the groups in terms of stress and trait or state anxiety before the intervention (P > 0.05). 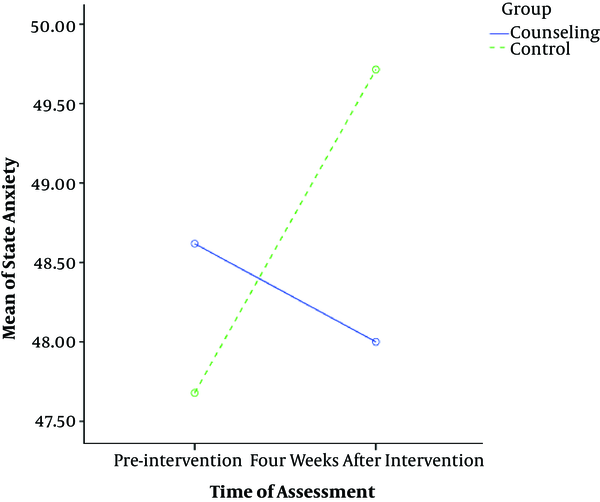 The mean (± SD) of the stress score in the counseling group changed from 35.4 (± 4.5) before the intervention to 34.8 (± 3.5) four weeks after the intervention while the score increased from 34.8 (± 6.3) to 37.8 (± 3.7) in the control group. Based on ANCOVA after the intervention, the mean score of perceived stress was significantly lower in the counseling group (adjusted mean difference = -3.4; 95% confidence interval = -2.3 to -4.4; P < 0.001) (Table 2, Figure 2). 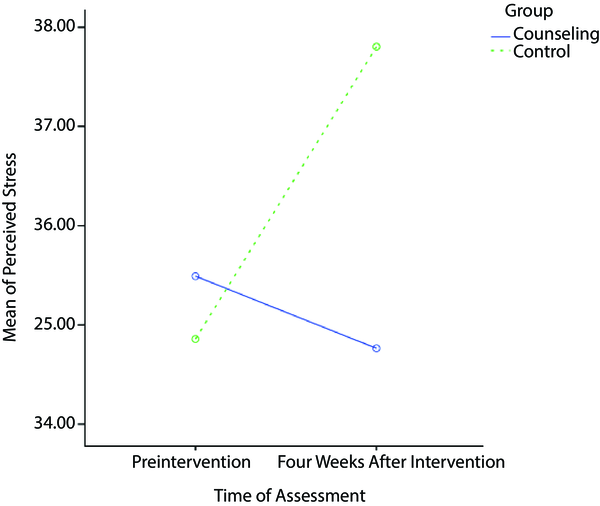 aT-test was used to compare the groups before the intervention and ANCOVA was used to compare the groups after the intervention with adjusting the baseline values and income level. bValues are expressed as mean (±SD). cMean difference (95% Confidence Interval). The mean (± SD) of the state anxiety scores in the counseling group changed from 48.5 (± 4.8) before the intervention to 48.0 (± 4.5) four weeks after the intervention, and from 47.8 (± 4.1) before the intervention to 49.7 (± 4.2) four weeks after the intervention in the control group. According to ANCOVA after the intervention, the mean score of state anxiety in the counseling group was significantly lower (-2.1; -3.6 to -5.5; P < 0.001) (Table 2, Figure 3). The mean (± SD) of the trait anxiety score in the counseling group changed from 47.4 (±4.6) before the intervention to 44.7 (± 4.0) four weeks after the intervention and from 49.0 (± 4.1) before the intervention to 46.0 (± 3.8) four weeks after the intervention in the control group. According to ANCOVA after the intervention, there was no statistically significant difference between counseling and control groups (-0.6; -2.0 to 0.7; P = 0.368) (Table 2, Figure 4). Because of the frequent relationships between midwives and patients, midwives can play an active role as an effective member of the health team in providing spiritual counseling and increasing the morale of pregnant mothers. Despite the effective role of spirituality in clinical midwifery settings, there have been a few interventional studies in this area (23). In the present study, spiritual counseling was effective in controlling stress and state anxiety of pregnant women but did not affect the trait anxiety. 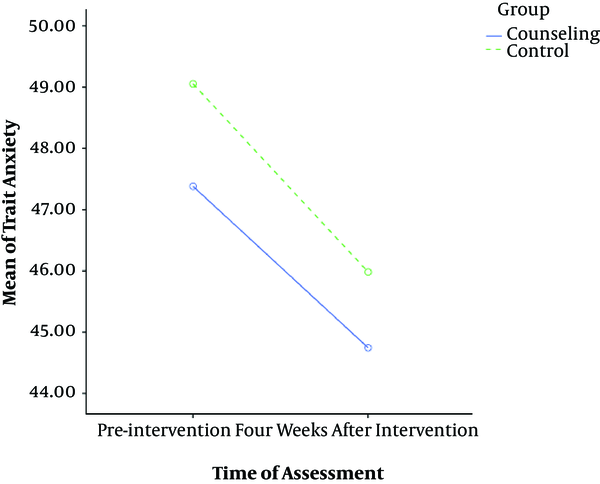 Furthermore, spiritual counseling reduced perceived stress in the intervention group. Jabbari et al. showed that the voice of Quran, with and without translation in pregnant women significantly decreased the mean score of perceived stress in the intervention groups compared to the control group (24). Wachholtz et al. also reported the positive effect of spiritual counseling on the relaxation of cardiac patients (25). A study by Reyhani et al., based on spiritual counseling and self-care education, reported that spiritual counseling reduces stress and increases distress tolerance of mothers with premature infants in NICUs (26). The results of a meta-analysis of 15 studies involving 14 controlled trials showed that spiritual interventions had significant effects on spiritual well-being, the meaning of life, anxiety, and depression (27). Vieten and Astin examined the effect of stress management interventions by midwives in the United States and reported a significant reduction in stress of the pregnant women in the intervention group (28). In a study by Tuck et al., spiritual care and its interventions did not have a much positive effect on the stress of the subjects (29). In the present study, spiritual counseling reduced the state anxiety score in the women of the intervention group but did not affect the level of trait anxiety. Mohammadi et al. used the stress management training with a cognitive-behavioral approach to the intervention group to control the stress of pregnancy. They reported that anxiety of pregnancy and worries in the intervention group reduced compared to the control group (23). This finding was consistent with the results of Saunders et al. about the effect of spirituality on anxiety control (30). The results of a systematic review showed that the religious/spiritual interventions decrease the anxiety and depression symptoms (31). The positive effect of spiritual counseling on reducing stress level and anxiety in pregnant women can be attributed to the alignment of spiritual counseling approach with culture and the beliefs of individuals in response to mental concerns and being seeking the meaning in human life (32). In this regard, Delarm et al. held counseling sessions to raise women’s awareness about delivery and its stages to reduce their anxiety in the intervention group and reported the mean anxiety score in the intervention and control groups respectively as 11.82 ± 8.3 and 23.5 ± 53.38 after the intervention in the third trimester (33). The results of a randomized clinical trial conducted in Isfahan, Iran, in 2012 showed that spiritual care program reduced the amount of anxiety in patients with leukemia (34). Mohammadi et al. examined a stress management-training program to improve mental health and reduce worries and anxiety in women and reported that pregnancy stress and anxiety in the trained women were significantly reduced after intervention (23). In a randomized clinical trial, spiritual counseling could decrease anxiety and depression in dialysis patients (35). These coherent studies can be attributed to the protective role of religion and spirituality in the face of events that cause distress and anxiety. Ghahari et al. found no significant relationship between spiritual counseling and stress and anxiety in women with breast cancer (36). The contradiction between the results of those studies and the present study can be attributed to the differences in physical conditions of individuals, underlying problems, lack of emotional support, treatment and related costs, or the difference in the role of spirituality and spiritual and religious experiences of individuals in the study populations. According to the results of this study, it can be concluded that spiritual counseling by trained midwives can be effective in controlling pregnancy stress and anxiety. According to the coverage of different health centers of the city, the results of this study can be used for the city of Maragheh and surrounding counties. On the other hand, due to the limited population of the women in Maragheh, the generalizability of the results of the research to all women with different cultures, ethnicities, and languages require more extensive studies. Due to the lack of time and financial support, it was not possible to measure and control the effect of the level of spiritual and religious beliefs of individuals and the type of emotional and psychological support that they receive during sessions from their relatives and friends, which can affect the counseling process in long run. Spiritual counseling can control the perceived stress and state anxiety of pregnant women. Therefore, spiritual counseling is recommended as a complementary, effective, and non-invasive intervention in controlling the psychological problems of pregnant mothers. In general, the use of religious beliefs to overcome pregnancy stress and anxiety is a decisive factor that can have an impact on women’s reproductive health and general health without spending high costs. The authors hereby thank the research deputy of Tabriz University of Medical Sciences and Tabriz nursing and midwifery faculty, the student research committee of Tabriz University of Medical Sciences, the participants in the study, and the personnel of Maragheh health centers. Authors’ Contribution: Masoumeh Haghighat made a substantial contribution to the conception of the study, the recruitment of women, the collection of data, and drafting of the manuscript. Mojgan Mirghafurvand (Corresponding author) was involved in the design of the study and performed the analysis. Mojgan Mirghafurvand, Sakineh Mohammad-Alizadeh-Charandabi, Jamileh Malakouti, and Mirmohsen Erfani supervised throughout the study and made a substantial contribution to the conception of the study. All authors revised the article, gave their comments on it, and approved the final version. Conflict of Interest: The authors declare no conflicting or financial disclosures. 1. Effati-Daryani F, Mirghafourvand M, Mohammad-Alizadeh-Charandabi S, Shiri-Sarand F, Zarei S. Sleep quality and its relationship with quality of life in Iranian pregnant women. Int J Nurs Pract. 2017;23(2). doi: 10.1111/ijn.12518. [PubMed: 28120358]. 2. Boivin J, Bunting L, Collins JA, Nygren KG. International estimates of infertility prevalence and treatment-seeking: potential need and demand for infertility medical care. Hum Reprod. 2007;22(6):1506-12. doi: 10.1093/humrep/dem046. [PubMed: 17376819]. 3. Rofé Y, Lewin I, Padeh B. Emotion during pregnancy and delivery as a function of repression-sensitization and number of childbirths. Psychol Women Q. 2016;6(2):163-73. doi: 10.1111/j.1471-6402.1981.tb00404.x. 4. Miller PM, Kreitman NB, Ingham JG, Sashidharan SP. Self-esteem, life stress and psychiatric disorder. J Affect Disord. 1989;17(1):65-75. doi: 10.1016/0165-0327(89)90025-6. [PubMed: 2525578]. 5. Shafaie FS, Mirghafourvand M, Rahmati M, Nouri P, Bagherinia M. Association between psychological status with perceived social support in pregnant women referring to Tabriz health centers. J Matern Fetal Neonatal Med. 2018;31(12):1554-60. doi: 10.1080/14767058.2017.1319934. [PubMed: 28460552]. 6. Dunkel Schetter C, Tanner L. Anxiety, depression and stress in pregnancy: implications for mothers, children, research, and practice. Curr Opin Psychiatry. 2012;25(2):141-8. doi: 10.1097/YCO.0b013e3283503680. [PubMed: 22262028]. 7. Kyrou I, Tsigos C. Stress mechanisms and metabolic complications. Horm Metab Res. 2007;39(6):430-8. doi: 10.1055/s-2007-981462. [PubMed: 17578760]. 8. Giurgescu C, Sanguanklin N, Engeland CG, White-Traut RC, Park C, Mathews HL, et al. Relationships among psychosocial factors, biomarkers, preeclampsia, and preterm birth in African American women: a pilot. Appl Nurs Res. 2015;28(1):e1-6. doi: 10.1016/j.apnr.2014.09.002. [PubMed: 25282477]. 9. Kurki T, Hiilesmaa V, Raitasalo R, Mattila H, Ylikorkala O. Depression and anxiety in early pregnancy and risk for preeclampsia. Obstet Gynecol. 2000;95(4):487-90. [PubMed: 10725477]. 10. Simon GE. Social and economic burden of mood disorders. Biol Psychiatry. 2003;54(3):208-15. [PubMed: 12893097]. 11. Arai YC, Ueda W, Ushida T, Kandatsu N, Ito H, Komatsu T. Increased heart rate variability correlation between mother and child immediately pre-operation. Acta Anaesthesiol Scand. 2009;53(5):607-10. doi: 10.1111/j.1399-6576.2009.01912.x. [PubMed: 19419354]. 12. 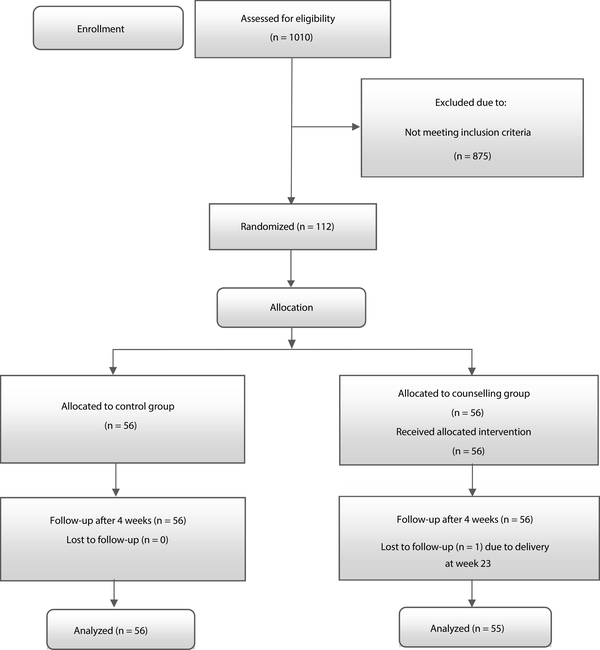 Sanaati F, Mohammad-Alizadeh Charandabi S, Farrokh Eslamlo H, Mirghafourvand M, Alizadeh Sharajabad F. The effect of lifestyle-based education to women and their husbands on the anxiety and depression during pregnancy: a randomized controlled trial. J Matern Fetal Neonatal Med. 2017;30(7):870-6. doi: 10.1080/14767058.2016.1190821. [PubMed: 27186630]. 13. Jannati Y, Khaky N. Psychiatry in midwifery. First ed. Tehran: Jamenegar; 2013. 14. Dunkel Schetter C. Psychological science on pregnancy: stress processes, biopsychosocial models, and emerging research issues. Annu Rev Psychol. 2011;62:531-58. doi: 10.1146/annurev.psych.031809.130727. [PubMed: 21126184]. 15. Moreira-Almeida A, Neto FL, Koenig HG. Religiousness and mental health: a review. Rev Bras Psiquiatr. 2006;28(3):242-50. [PubMed: 16924349]. 16. Desrosiers A, Miller L. Relational spirituality and depression in adolescent girls. J Clin Psychol. 2007;63(10):1021-37. doi: 10.1002/jclp.20409. [PubMed: 17828762]. 17. Bahrami N, Simbar M, Bahrami S. The Effect of Prenatal Education on Mother's Quality of Life during First Year Postpartum among Iranian Women: A Randomized Controlled Trial. Int J Fertil Steril. 2013;7(3):169-74. [PubMed: 24520482]. 18. Morrison JQ, Clutter SM, Pritchett EM, Demmitt A. Perceptions of clients and counseling professionals regarding spirituality in counseling. Couns Values. 2009;53(3):183-94. doi: 10.1002/j.2161-007X.2009.tb00124.x. 19. Sharajabad FA, Mohammad-Alizadeh Charandabi S, Mirghafourvand M. Life satisfaction and its relationship with spiritual well-being and religious practice in Iranian adolescent girls. Int J Adolesc Med Health. 2017. doi: 10.1515/ijamh-2017-0077. [PubMed: 28782351]. 20. Mirghafourvand M, Charandabi SM, Sharajabad FA, Sanaati F. Spiritual Well-Being and Health-Related Quality of Life in Iranian Adolescent Girls. Community Ment Health J. 2016;52(4):484-92. doi: 10.1007/s10597-016-9988-3. [PubMed: 26787114]. 21. Bastani F, Rahmatnejad L, Jesmi F, Haghani H. Reastfeeding self efficacy and perceived stress in primiparous mothers. Iran J Nurs. 2008;21(54):9-22. Persian. 22. Gholami Booreng F, Mahram B, Kareshki H. Construction and validation of a scale of research anxiety for students. Iran J Psychiatry Clin Psychol. 2017;23(1):78-93. doi: 10.18869/nirp.ijpcp.23.1.78. 23. Mohammadi ZD, Bosaknejad S, Sarvghad S. A survey on the effectiveness of stress management training with cognitive-behavioral group therapy approach on state/trait anxiety, pregnancy anxiety and mental health of primiparous women. Jentashapir J Health Res. 2013;3(4):495-504. Persian. 24. Jabbari B, Mirghafourvand M, Sehhatie F, Mohammad-Alizadeh-Charandabi S. The Effect of Holly Quran Voice With and Without Translation on Stress, Anxiety and Depression During Pregnancy: A Randomized Controlled Trial. J Relig Health. 2017. doi: 10.1007/s10943-017-0417-x. [PubMed: 28560489]. 25. Wachholtz AB, Pargament KI. Is spirituality a critical ingredient of meditation? Comparing the effects of spiritual meditation, secular meditation, and relaxation on spiritual, psychological, cardiac, and pain outcomes. J Behav Med. 2005;28(4):369-84. doi: 10.1007/s10865-005-9008-5. [PubMed: 16049627]. 26. Reihani T, Sekhavat Poor Z, Heidarzadeh M, Mosavi SM, Mazlom SR. The effect of spiritual self-care training on feeling of comfort in mothers of hospitalized preterm infants. J Midwifery Reprod Health. 2014;2(2):112-9. doi: 10.22038/jmrh.2014.2261. 27. Oh PJ, Kim SH. The effects of spiritual interventions in patients with cancer: a meta-analysis. Oncol Nurs Forum. 2014;41(5):E290-301. doi: 10.1188/14.ONF.E290-E301. [PubMed: 25158666]. 28. Vieten C, Astin J. Effects of a mindfulness-based intervention during pregnancy on prenatal stress and mood: results of a pilot study. Arch Womens Ment Health. 2008;11(1):67-74. doi: 10.1007/s00737-008-0214-3. [PubMed: 18317710]. 29. Tuck I. A critical review of a spirituality intervention. West J Nurs Res. 2012;34(6):712-35. doi: 10.1177/0193945911433891. [PubMed: 22309991]. 30. Saunders T, Driskell JE, Johnston JH, Salas E. The effect of stress inoculation training on anxiety and performance. J Occup Health Psychol. 1996;1(2):170-86. doi: 10.1037/1076-8998.1.2.170. [PubMed: 9547044]. 31. Goncalves JP, Lucchetti G, Menezes PR, Vallada H. Religious and spiritual interventions in mental health care: a systematic review and meta-analysis of randomized controlled clinical trials. Psychol Med. 2015;45(14):2937-49. doi: 10.1017/S0033291715001166. [PubMed: 26200715]. 32. McCabe G. Mind, body, emotions and spirit: reaching to the ancestors for healing. Couns Psychol Q. 2008;21(2):143-52. doi: 10.1080/09515070802066847. 33. Delaram M, Soltanpour F. The effect of counseling in third trimester on anxiety of nulliparous women at the time of admission for labor. Zahedan J Res Med Sci. 2012;14(2):61-5. Persian. 34. Moeini M, Taleghani F, Mehrabi T, Musarezaie A. Effect of a spiritual care program on levels of anxiety in patients with leukemia. Iran J Nurs Midwifery Res. 2014;19(1):88-93. [PubMed: 24554966]. 35. Aghajani M, Afaze MR, Morasai F. The effect of spirituality counseling on anxiety and depression in hemodialysis patients. Evid Based Care J. 2014;3(4):19-28. doi: 10.22038/ebcj.2013.2016. 36. Ghahari S, Fallah R, Bolhari J, Moosavi SM, Razaghi Z, Akbari ME. Effectiveness of cognitive-behavioral and spiritual-religious interventions on reducing anxiety and depression of women with breast cancer. Knowl Appl Psychol. 2012;13(4):33-40. Persian.